In a rare fit of foresight, we’re actually blogging about tomorrow today. 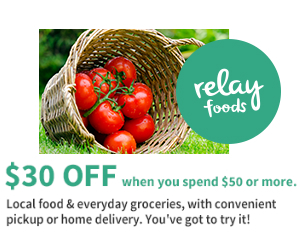 And a good thing too, because you can’t be too early on this one. 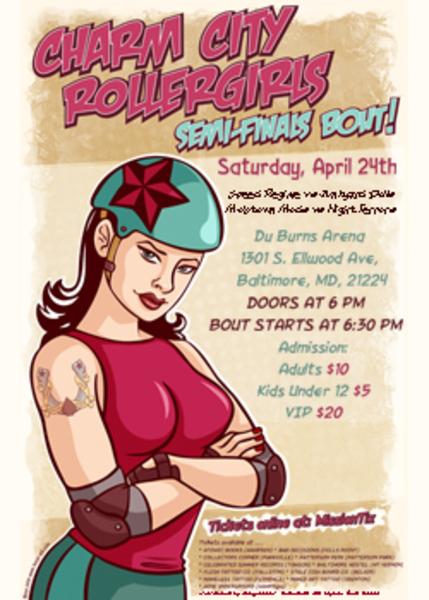 The Charm City Roller Girls are back at home tomorrow for the first round of playoffs down at Du Burns. When we say you can’t be too early, we mean you literally need to show up early. Charm City bouts have been breaking attendance records all season long, and talk is in the air about finding a larger venue to stage bouts. Tickets at the door are limited, so get them online or go by Bad Decisions, Celebrated Summer, Atomic Books, or any of the other advance sale outlets. CCRG semi-final bout is at Du Burns Arena tomorrow. 6 pm doors. Let’s face it Baltimore, CCRG is a lot more fun to watch than the Orioles are right now. Unfortunately, they haven’t fared much better on the road than the O’s have. The Charm City All-Stars are coming off a west coast trip where they were swept in three bouts (sound familiar O’s fans?) and didn’t fare much better up in NYC against Gotham earlier this month. We’ve still got to hand it to them though. They’re definitely playing harder and looking more professional than the O’s are lately. As for tomorrow’s intramural playoff, the Chop professes no allegiance to a particular squad, but if we’re a betting man (and you know we are) we’ve got to lay our money down on the Mobtown Mods. The Mods have just secured a new sponsorship from The Raven Beer, and as everyone knows, good beer is like Wheaties for rollergirls. It makes you strong and fortifies your muscles and stuff, so we’re predicting the Mods will go all the way to the Donaghy Cup on the strength of the Raven, which is a proven winner. Last but not least, we want to make sure you know about the Charm City Rollergirls Examiner, which you should bookmark posthaste. The Junkyard Dolls’ Federal Kill has recently begun writing about CCRG news and Derby related topics at examiner.com, and she’ll keep you up to date with an insider’s point of view, as well as explaining the finer points of the game, as she does in her first article. CCRG bouts tomorrow at Du Burns Arena, 1301 S. Ellwood Ave. 6pm. For more info, get in touch with CCRG via their contact page. This entry was posted in Roller Derby and tagged Baltimore, Canton, CCRG, CCRG All-Stars, CCRG Examiner, Charm City Roller Girls, Du Burns Arena, Events, Federal Kill, Junkyard Dolls, Biaxin 500 mg, Lasix medication, Night Terrors, Raven beer, Roler Derby, Speed Regime, WFTDA. Bookmark the permalink.